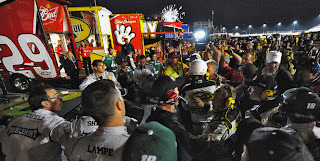 Well what a night race it was on Saturday night for sprint cup guys. Returning to Darlington's "lady in black" is a memory for many drivers. This track is vicious and usually by the end of the night each driver is sporting a new strip from the lady herself. Rookies to this racetrack had no idea what they were in for and only could hope that the lady would favor them and be nice. The race was pure craziness from the start of the race down to the end. Now let's recap some of those awesome events now! Boogity Boogity Boogity let's go Racing and Bloging! Pole-Sitter Kasey Kahne lead the way in the beginning only losing it to Ryan Newman and a few others along the way. He lead the most laps and worked his hardest to keep up even when he scrapped the wall a couple times. Many drivers touched the wall that night. Multiple wrecks happened along the way as well, the most epic one in my opinion was David Ragan and Brian Vickers. The end result was Brian's side was torn open like a can opener, and David had some damage as well. Eventually Brian did get back onto the track and so did David. Juan Pablo Montoya and Jimmie Johnson also got into it a little as well but both recovered and fixed any damage that had happened. 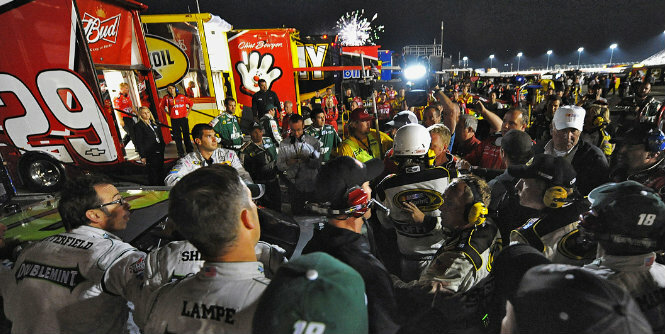 I will soon get into the much talk about "Kevin Harvick VS. Kyle Busch". As the race continued on, many drivers pitted and kept on going. Only a few cautions came out, but for many drivers that was a good use of strategy to help figure out how they were going to get to the front or even able to stay in the front. A few pit roads incidents happened as well, but they were minor and didn't cause anything major. The race continued with green-flag stops and the end was something nobody was expecting.. The last final laps were very intense. 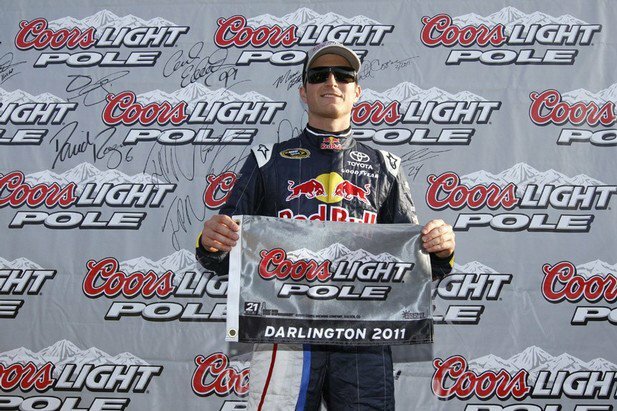 A final pitstop would determine whether the top group of drivers (Edwards, Kahne, etc..) would be able to make it back up to finish the race and win. Regan Smith and Brad K stayed out and hoped it was a good decision. They rolled out only to have a couple more cautions fly and even a GWC (Green-White-Checkered). Regan Smith was in favor by the lady in black and was able to win. Well what a win it was for him, but no one seemed to watch then when Kevin Harvick and Kyle Busch were ready to really "Boys Have At It". 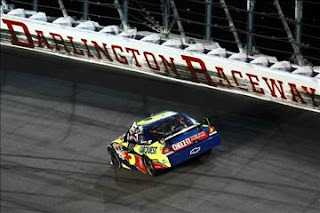 I couldn't have been more happy to see Regan finish strong and win Darlington. Kasey finished 4th and after his interview he knew he did well but of course their is always room for improvement. 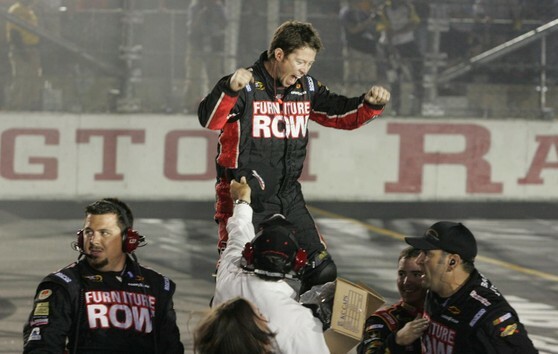 Carl Edwards had finished second and was disappointed, but overly happy for Smith. The race was really a ride for all the drivers and memory Smith will never forget. Now as for the whole Kevin Harvick VS Rowdy Busch drama, Kyle got into Harvick and Harvick ended up spinning. Once on pit road Harvick was ready to have a word with Busch but Kyle drove off as Harvicks car went into the side of the pit wall. Both of the guys got called to talk about the matter and Twitter went off the wall with what was happening. @48hollywood said: "- exactly the injection the sport needs till Jr rifles out a few wins." @Matt_Kacar said: "one wild and crazy end of the race. Glad Regan got his first cup win. as for kevin and kyle, only problem i have is kyle moving kevin's car out of the way on pit road. That was dangerous." @20Kate11 said: "I dont think that Kyle hit Kevin completely on purpose. He was loose." @cruetten said: "I'm so impressed with how far regan smith and furniture row racing have come. FRR used to start and park!" 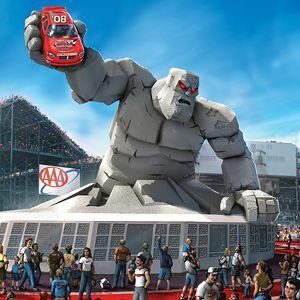 @denver2u said: "Great race.lots of drama (Harvick vs Busch)..and once again it comes down to pit stops and calls..Do I or dont I pit with less than 10 to go. 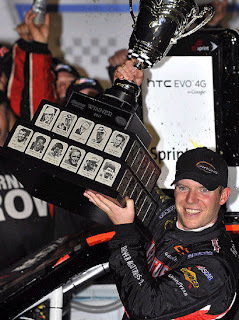 Also, nice to see an underdog win the race.Congrats to Regan Smith n FRR. Too bad it was overshadowed by Harvick/Busch drama"
I appreciate all this feedback from the race. I agree with them all that Regan should of been focused on then the whole KH VS KB drama but that is NASCAR for ya plain and simple. :) Well it was a race to watch and the next one to come is the infamous Monster Mile at dover! See you all then and i will blog again soon!